Martin Rodriguez sat on the floor of the hospital, his wet clothes still clinging to his skin. A doctor had just told him that his friend, Anastasio, had died. Devastated, Martin asked God why he was still alive. Earlier that Easter Sunday afternoon in 2004, Martin, Anastasio and some other members of a young adult group from St. Mary Parish in Indianapolis had visited Eagle Creek Park to celebrate the holiday and the birthdays of three group members. The friends marking their birthdays were thrown into the park’s reservoir as a joke. In the process, Martin also fell in. Not knowing how to swim, he flailed about and started to sink in the cold water. Most of the members of the group thought he was joking and walked away. Others came in to help and brought Martin to shore. But Anastasio was nowhere to be found. A 911 call followed. Rescuers found Anastasio in the water. He was rushed to Methodist Hospital in Indianapolis, where he was later pronounced dead. As Martin pondered the meaning of his life in the face of his friend dying to save him, he remembered a prayer he made to God a month earlier. It was the spring of his senior year in high school and he was wondering if God might be calling him to the priesthood. He promised God to become a seminarian. But he wasn’t sure if the priesthood was really meant for him. Now, after seeing his friend’s self-sacrifice, he had more conviction about his future. Nine years ago, Anastasio laid down his life to keep Martin alive. On May 18, transitional Deacon Martin Rodriguez will lay down his life in service to Christ and the Church when he is ordained a priest in SS. Peter and Paul Cathedral in Indianapolis. He will be the first Latino to be ordained a priest for the Archdiocese of Indianapolis in nearly half a century. 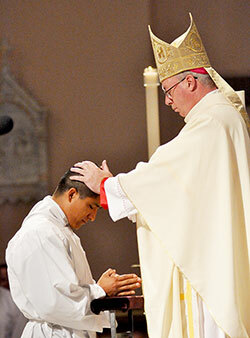 And he will be the first person born in Mexico to be ordained a priest for the Church in central and southern Indiana. Deacon Rodriguez moved to Indianapolis from his native Mexico with his mother and three brothers in 2002 when he was 17. His father had moved to the city in 1999. At the time of his arrival in Indianapolis, Deacon Martin’s connection to his faith was tenuous. He hardly ever went to Mass, and had not participated in any youth ministry programs in Mexico. That all changed in Indianapolis. The example of faith of his mother, a cousin his age and a leader of the young adult group led him to go to Mass every Sunday. He also liked the young adult group’s social events. Eliecer de la Cerda was a leader in the young adult group and a member of the parish choir with Deacon Rodriguez. A former seminarian in Mexico, de la Cerda talked to him about what vocation God might have in store for him. His parents, Martin and Ninfa Rodriguez, admitted that while their oldest of four children—all boys—was growing up, they had no inkling he would pursue a religious vocation. But now that he is a few weeks from ordination, they are excited because he will be the first priest in their family. “We’ve been waiting for that moment for four years,” his father said. The dramatic turn of events of Easter 2004 was part of the sign from God that led Deacon Rodriguez to the seminary. But other factors also opened him up to the possibility of the priesthood—vocations dinners at St. Mary Parish and the priestly life and ministry of the faith community’s longtime pastor, Father Michael O’Mara. Deacon Rodriguez appreciates how hard Father O’Mara works to serve the people of the parish. And he saw the value of a priest’s compassion when Father O’Mara came to the hospital after Anastasio died to spend time with the members of the young adult group. For his part, Father O’Mara sees a renewal in his own priestly life and ministry as he has watched his parishioner progress through his priestly formation during the past nine years. When Deacon Rodriguez is ordained a priest on May 18, Father O’Mara will help put his priestly vestments on him. His family, too, thinks he will bring many gifts to the priesthood. Deacon Rodriguez will make history in becoming the first person born in Mexico to be ordained a priest for the Archdiocese of Indianapolis. He never felt drawn to enter into priestly formation for a diocese in the country of his birth. He appreciates that he is making history in his ordination, but also sees it as a challenge. “If I’m the first one in 50 years, I think there’s a lot of work to do to get more vocations,” Deacon Rodriguez said. Latino Catholics from across central and southern Indiana attended his ordination as a transitional deacon last June in the cathedral. After the liturgy, Deacon Rodriguez spent a long time talking and having his picture taken with them. May 18 will be an exciting day for Deacon Rodriguez, his family and so many Latino Catholics across central and southern Indiana. Yet on that historic day, Deacon Rodriguez, even with his heart and mind swirling with so many thoughts and emotions, will return in gratitude to his own historic day in 2004 when his friend laid down his life so that he might live. Seminary: Bishop Simon Bruté College Seminary in Indianapolis and the Pontifical North American College in Rome. Hobbies: Playing soccer, exercising, playing the guitar. Favorite Bible verse: “No one has greater love than this, to lay down one’s life for one’s friends” (Jn 15:13).